Do We Need Mandatory Safety Classes for Gun Owners? I investigate the need for increased safety among gun owners. Earlier I posted about the dramatic decline in accidental fatalities among children under 15. Here I add the fatality rate for all ages. 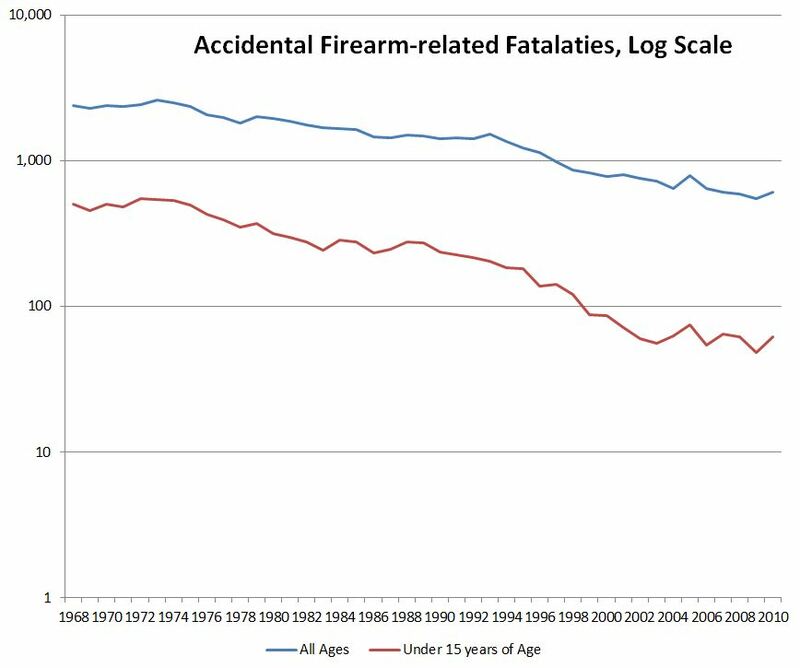 This shows the dramatic decline in all firearm-related fatalities. It appears that the decline has been steeper for all ages than for children under 15. That, however, is not correct. Plotting this on a log10 scale shows that the slope for the children’s fatalities is steeper than that for all ages. That means that the rate of decline has been even faster for children. 5 Responses to Do We Need Mandatory Safety Classes for Gun Owners? Glad to have learned about John Smith 223 blog. Very smart approach to “reasoning through the gun control debate.” This particular entry is typical of his posts in general. Thanks for the shout out. Reading your excellent blog, I think you and I are on about the same wavelength. Maybe not “mandatory” safety classes, but to what extent is the decline in accidental gun fatalities due to an increasing emphasis on safety among gun owners themselves? I’m not sure about the very steep decline in the middle 1970s, but the NRA’s Eddie Eagle program began in late 1980s and we see a steep decline beginning in the early 1990s. 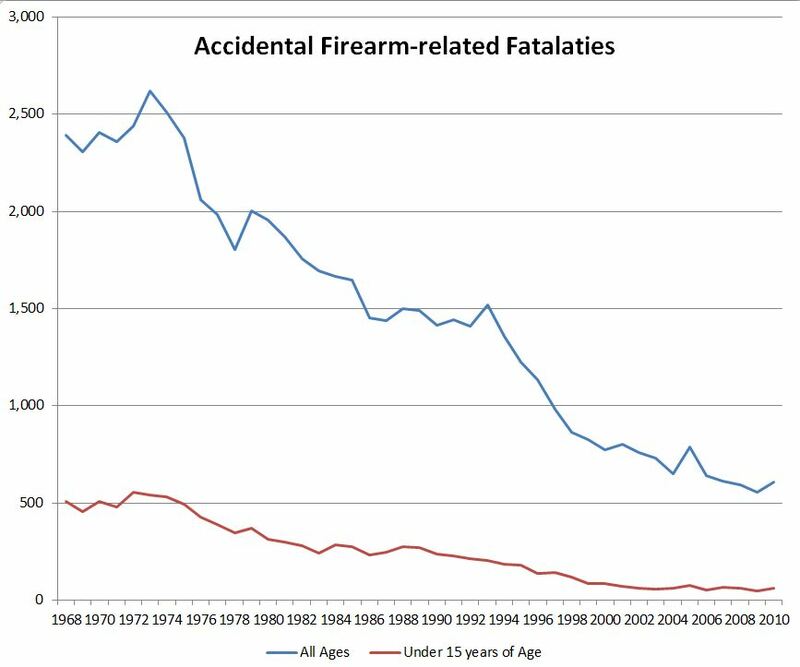 Another possible explanation is that what were once accidental gun fatalities are now just accidental gun injuries due to improvements in emergency and trauma medicine. I haven’t investigated this specifically, but it seems possible at least. Mandatory training gets mentioned from time to time. For example, the nominee for Surgeon General called for such training in response to the Newtown horror. In addition, Maryland now requires safety training for new handgun owners. You raise a good point about the cause of the decline. One way to investigate would be to examine accidental firearm injuries. Unfortunately, I could only find CDC nonfatal injury data going back to 1999. I looked into an alternative: all fatal injuries from 1979 to 2010. It’s not as productive, but I did find some useful tidbits, so I’m writing a post on them.